This is a very interesting medieval English occupational surname. According to Canon Charles Bardsley writing in the year 1880, it describes a groom, one whose specific duty was to teach horses to amble. This was a gait between a walk and a trot where both legs on one side moved together, providing a smooth movement. 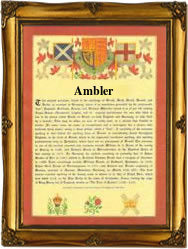 The word amble derives from the Latin ambulare, meaning to walk, although ambling is rather more than walking. Palfreys, a light saddle horse, were regarded as being particularly suitable for women and elderly people, and were as a matter of course, taught to amble. In the records known as Whitakers Craven for the year 1320 we have the entry in Latin of - Item: pro informatione unius pulli ad amulandum, 11s 6d. This figure would have been a significant sum, the equivalent of several weeks wages. Occupational surnames were amongst the first to be created in about the 12th century. However they did not generally become heriditary unless a son or sometimes a daughter, followed the father, or sometimes the mother, into the same skill or business. In this case the first recording may be that of Thomas le Amblur of York in the Hundred Rolls of landowners in 1273, whilst William Ambler without any preposition appears in the same rolls. This suggests that the first named holder may have the name as a nickname. Ambler and Palfreyman are both particularly popular surnames in the county Yorkshire.